Conversion Rate: What Do You Mean by this Term? 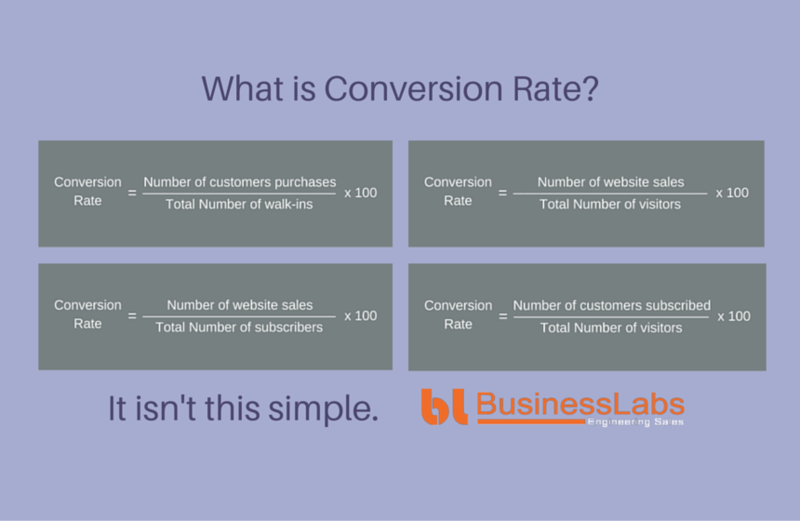 Conversion Rate: What Do You Mean by this Term? Wireframing, A/B testing, conversion rate funnel, statistical power, heuristic evaluation- no, no, that is not what this post is about. It is about the very basics of conversion rate optimization which almost 60%+ of the website owners doesn’t know in detail. Whether you are an owner of a new business or a web designer, I know, the conversion rates of your visitors into customers always stays at the back of your mind. I know so because I felt the same way when I had first started out, and sometimes I still think about it! Moreover, with so many techniques or tips of optimizing the conversions doing the rounds, one can’t help but feel like Prince Hamlet. You know Hamlet, right? The guy who stood in a dark lobby, and while contemplating death and suicide said, “To be or not to be.” Well, he could have been contemplating conversion rate, and felt just as lost; because there are too many options/advice out there, and everyone is following them. To top it off, the scary thought-“if it worked for them, will it for me as well?” always looms over the head. So, whether a particular suggestion is game-changing or will lead to an eventual death or is an immediate suicide, it is uncertain. Moreover, when we, as business owners or web designers, count every opinion or follow random tactics, we make bad choices and ultimately neither does our website stand out nor does our product/service. What one must do is defog their minds with information and aim according to their particular site’s needs. So, let yours be a casual blog or an e- commerce store or a service company, with my experience I will try my best to clear the misconceptions you might have about conversion rate optimization. You might just find what works for you and what doesn’t, or at the least you will be able to take an informed step towards your success!! In the simplest of language, conversion rate refers to the number of visitors of your website that become buyers or long-term customers. Tell me to explain that further with an example. Suppose, you have a brick and mortar store and a 100 visitors come to you. Out of which, 4 buy your stuff. Then, your conversion rate sums up to 4%. However, this is just the tip of the iceberg. If a mere definition were enough, then no business or website would have a dwindled out of the picture ever. When it comes to conversion rate, there is no trick or tip better than giving your visitor/ reader exactly what they came looking for. If they have come looking for instructions to fix their printer, your call-to-action to buy your printer should not be given right away. Especially when a lot of your traffic comes from Internet searches. Let them follow you on Facebook, let them subscribe to your e-mail newsletters, let them have a demo of your services; understand the genuineness of your product. Then, let it materialize into something solid. This is how conversions happen in the world of online business; people are cautious these days, and they won’t take many risks, and they question your credibility at every step. You will have to form a relationship. Moreover, this relationship usually begins online in today’s tech-savvy world. Having a website of your services or product is no longer optional, it is the oxygen of your business, it is the salt in your dinner, and without it, your business is like a doorbell that doesn’t ring. It is essential to hit the right chords with your customers or viewers. You may opt for the services at BusinessLabs to achieve your targets. A potential customer gets online to search, it finds you online, reads about you, reads your reviews and then decides to walk in your store or purchase through your website. So, instead of having a bird’s eye view or a generalized perspective of the concept of conversion rate optimization, you should try to dwell deeper into the concept. When you focus on the many ways to compute conversion rates, you collect data, and data helps you optimize. You end up with set targets and a planned motive that is to increase the sales of your website. This way you know which blog post is productive and profitable and which isn’t. You can evaluate different objects of your website based on conversion rates and weed out the unnecessary. Likewise, marketing managers or site owners use the concept of CRO for varied and specific reasons, and not just to compute the rate of their sales. They know that a lot of objects on your website directly or indirectly affects the conversion rates. Therefore, they optimize their web design accordingly. Scrutinizing every detail of the site is essential to discover what is good to keep and what should be chucked out. This post is all about aiming for exactly what a particular kind of website requires; actively making customers out of visitors; it is about gaining knowledge and using it to generate maximum profits for your clients or your site. No hacks, no tricks, just plain, pure knowledge! To say every online business website is same is wrong. Every website has its unique requirements. However, like how atoms are a basis of matter, computing different kinds of conversion rates and using the information in correct manner, forms the foundation on which you can build the building of profits! You can learn about a few more basic unique ways of applying conversion rates that I have found to help me a great deal to enhance the online presence of different websites here. Superficially, it is email marketing and reader-webpage engagement that have a pronounced effect on any website. Let’s talk about the significance of this phenomenon, shall we? Email marketing is a powerful tool to generate leads. The content on your website may fail to connect to readers, but emails never fail to address their concerns. Emails form a warm relationship with your potential customers and can generate repeat customers. What is not there to like about it! Coming to webpage-reader engagement, as long as a reader finds the content, relatable, helpful and compelling, he/she is bound to buy from you. Now, let’s get specific and see what areas of a webpage are necessary and how we can compute their conversion rates for good and beneficial optimizing. You need to know how a new visitor browses your website. So, compute webpage transitions in the first session by a new visitor. It is a crucial factor in the conversion rate and its optimization study as it tells you what the visitors are skimming over, what they are skipping and what they are expecting to find. Evaluate conversion rates of repeat visitors who come to your website organically, i.e., who do not come through remarketing ads. You’ll get an insight into the kind of internet searches that are working in your favor. You’ll be able to optimize your keywords accordingly. Evaluate conversion rates of repeat visitors who come through ads. Compute the conversion rates of your blog post readers who end up on your landing page, to know how well the readers connect with your content. Also, compute those conversion rates that happen through blog readers who share your content. It is essential to know what kinds of posts are bringing traffic to your website, don’t you think? Figure out the conversion rates of blog readers who make genuine comments. You’ll know how far the content is engaging. How many blog readers buy on their first visit to the landing page, you’ll need to figure that conversion rate as well. Shows how your content is convincing. Calculate, through conversion rates, the number of visitors who purchase over multiple visits in a defined time frame. Compute the conversion rates of those visitors who take the time to go through your blog content, learn about your services; form a virtual relationship with your brand before making any purchase. You can find out the conversion rates that are happening through keywords. When you do so, you use that keyword more often that eventually helps your posts to appear in the first searches for these keywords. You can learn a lot more about keyword optimization here. Do you know the most valuable asset of your webpage is your call-to-action? Use the computation of conversion rates to know what call-to-actions are making sales or which ones need to be improved. You will find more about the benefits and the way to optimize them here. Figuring out how well your emails are doing with your visitors or customers is also essential. Here a few areas of email marketing whose conversion rates will help you improve the over-all efficiency of your emails. You must have 10-15 emails right now in your inbox that you have either reported as spam or simply not opened them at all. Well, so do your visitors! Suppose you know what is compelling your visitors to click open your emails, don’t you think it is bound to generate leads? Take optimization on email open rates one step further by getting accurate. Find out what’s working with the old customers. See what the new ones are digging. Based on this data, you can customize your products/services which will make the subscribers sought out your brand for their future needs as well. Click through rates of your email determine the number of subscribers who have clicked on one or all the links in your email. Conversion rates of email click-throughs convey the success of your marketing campaign. Moreover, when you branch out this category based on old and new subscribers, you get a more refined data. Evaluate the conversion rates subscribers who end up buying from you. You can categorize it based on old and new subscribers as well. The number of email subscribers who renew your monthly or yearly subscription-based products/services through emails that you will need to evaluate too. Conversion rates of renewing subscribers convey your success rate. Also, you will need to discern the conversions happening at every stage of your email marketing or every element of your webpage. There are a lot of misconceptions about the process of optimizing conversion rates of a website. This lack of understanding can be attributed to the fact that advices/hacks/ tips regarding conversion rate optimization are found in every nook and corner of the internet. Massive information like this amounts to absolutely nothing because somehow it lacks in substance. The solution to this problem is to get educated about the concept of CRO. It is only then that one will able to collect substantial data and use it to generate leads. The fundamental purpose of working with conversion rates is to gather critical information as to how the visitors can be turned into customers. But, once we understand CRO we will realize that conversion rates can be used to calculate the potential of a lot of other elements of our web design than just the sales. We should focus on these elements because there are a whole lot of factors that affects your conversion rates directly or indirectly. The webpage-reader relationship and email marketing have a pronounced influence on conversion rates. Therefore, they need to be monitored closely. Every website is different, and every site needs its data for maximum benefits. When you compute the conversion rates of your call-to-action, or the conversion rates generating from your blog posts and in the case of email marketing, evaluating the conversion rates of subscribers who purchase or click on the links, you do just that. I am sure with this information at your disposal you will be able to revolutionize your online business. Although, the tips and tricks out there are a bit vague, with the power of knowledge in your hand and the data that you will manage to gather with this knowledge, maximize your profits and revenues. You need not rely on the tips completely. If you still have any question for me, you can leave your query/message here or in below comments. You can also let BusinessLabs save you a lot of trouble. BusinessLabs can optimize conversion rates for your website or design other aspects of your webpage, just as it has done for several other business owners. You can also let us save you a lot of trouble and help you optimize conversion rates for your website or design other aspects of your webpage. BusinessLabs have done for several other business owners. You can have a look at all the services we offer and decide what you would require the businesslabs team to do for you.